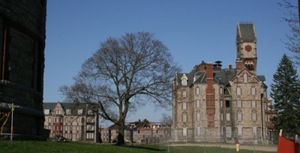 Taunton was established in 1854 and was the second institution in Massachusetts. It was one of the first institutions that I was able to visited and photograph. A large fence seperated the original Kirkbride buildings (which I believed were demolished) and a fire had destroyed some of the original buildings.